On Sunday had the privilege of fishing with Ken Breaux of Project Consulting Services, Inc. Kevin, and his wife Donna Hurst we started down Dudenhefer's Bayou heading out to BLACK BAY FOR SOME Trophy Trout!!! We had THE BAIT SOME LIVE CROAKERS FROM BAIT MAN BOOGIE, THANKS TO A GREAT FRIEND BOGGIE WHO EVEN SOLD ME THEM AFTER HOURS!!! This is what the Trophy Trout!!! Are eating they hate them, because the CROAKERS Are eating the trout eggs. We had the perfect weather and tide was less than Saturday but ok for the HOT SPOTS that were fishing!!! We ended the day with: 50 Speckled Trout up to 6.525lbs Donna Hurst Winner of 1st place in the Back to Lake Fishing Rodeo!!! (Lake Pontchartrain Basin Foundation). Kevin Hurst trout was 4.8oz just missed 3rd place by about 6oz. Had the privilege of fishing with Project Consulting Services, Inc. Gary Vogt, C. A. Spricks, friend Clyde Gravois and I started down Dudenhefer's Bayou heading out to BLACK BAY FOR SOME Trophy Trout!!! FOR THE RUMMEL RODEO!!! We had THE BAIT SOME LIVE CROAKERS!!! This is what the Trophy Trout!!! Are eating they hate them, because the CROAKERS are eating the trout eggs. We also used Live Shrimp, Live Minnows, Live Shad, Dead Shrimp, and Lures. We had the 3' to 4' waves for the HOT SPOTS that were fishing!!! 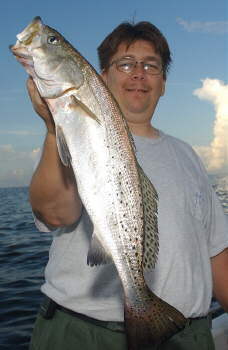 We ended the day with: 1 WINNER GARY VOGT WITH 3RD IN SPECKLED TROUT 5.7 LBS in THE RUMMEL FISHING RODEO!!! GET DA NET!!! I HAD ONE THAT WAS 5LBS DID NOT MAKE IT. 34 TOTAL SPECKLED TROUT ALLTrophy Trout!!! 2 REDFISH Bragging rights belonged to GRAY VOGT Winner of 3RD place in THE RUMMEL FISHING RODEO!!! With the biggest trout we had of the day!!! Had the pleasure of fishing with The Dude, Captain Warren Dudenhefer of Dudenhefer's Fishing Charters Inc. out of Hopedale this past Friday. Norman Flynn and I went down late Thursday night and stayed at Capt. Dude's Camp. I, of course, had to watch the Saints game before I left. Saints lost.again, but hey, it's only pre-season. Should have passed on the Saints game and left earlier to go down to the camp as The Dude has a really nice camp (the A/C is ice cold!). Its located right on Bayou la Loutre, has a lighted pier for night fishing, sleeps up to 6 and has a fully equipped kitchen, and new washer and dryer. Norman found the coffee and set up the pot for the next morning. Trophy Trout!!! One Hefty 6lbs 27 inches Long It Would Have Been Over 7lbs if she haven't laid the egg. The Reggio RODEO we placed 2 in the Speckled Trout that weight in at 4.52lbs and 1st place in the 5 stringer Speckled Trout total weight was 20.11 lbs.